Kavros is a tourist area on the National Road Chania-Rethymnon, approximately 41 km east of Chania and 19 km west of Rethymno, only just 3 km from Georgioupolis. Although it is close to Rethymno, the area is considered to belong in the prefecture of Chania. An amazing area with a wide variety of hotels covering your every need, one next to the other, with the 10km long beach stretching from Georgioupolis beach and ending to the east up to Episkopi, is the ideal destination to consider when travelling abroad. The beach is perfectly organized, but is exposed to the north winds so have that in mind and be careful when you swim and its quite windy. 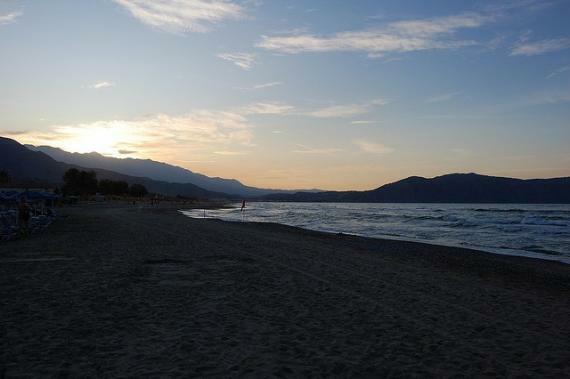 Apart from that we are talking about an amazing beach that will make you absolutely adore the area of Kavros. This is the ideal holiday destination for families that wish to spend quality time together far and away from all the busy winter times and discover their more natural self. The thing is that here it would be difficult for you not to adore this beach! Besides Kavros is a seaside resort that is in general a quieter place than Georgioupolis and is situated in the heart of the astonishing Kavros. Besides the most characteristic part of the district is the natural water system which is thought to be one of the most important systems in the East Mediterranean. With Lake of Kournas, Almiros River, and an amount of streams like Delfinas River that borders on the beach, you will fell astonished by this diverse and amazing scenery in the heart of Chania. Take you time to relax and swim at one of the most amazing beaches in the whole of Crete as only this way you will be able to understand what the Greek summer is all about: sea and sun in the front row! Find information about selected Hotels, apartments and rooms in Kavros to choose the perfect place for your accommodation.